Exh. Society of Independent Artists, 1934. ​​​​Edith Branson was an American modernist painter who created her own interpretation of the multitude of avant-garde movements that blossomed in Europe and New York City in the early 20th century. She was a significant contributor to the New York art scene both through her numerous exhibitions and in the roles she served as a director of the Society of Independent Artists (1934-1940) and as one of the officers of Emily Francis' Contemporary Arts Gallery. Branson exhibited nearly every year from 1921-1941 with the Society of Independent Artists, as well as with the Municipal Art Galleries (1938). She was also given a solo show at the Contemporary Arts Gallery (1935), joining such other promising new artists as Mark Rothko (1933) and Alice Neel (1938) both of whom would also receive their first one-person show at the Contemporary Arts Gallery. Edith Branson was professionally recognized by many of the art critics of her day. She was one of the few singled out from "the rank and file by virtue of definite merit" and in several other exhibitions as noteworthy of mention. Fellow contemporary artists, Jonas Lie and Richard Miller, were part of the panel that juried her work into the Corcoran Gallery 14th Biennial Exhibition of Contemporary Art in 1935. In 1937 and 1938, Edith Branson was invited to exhibit with the New York Society of Women Artists, a group that included Theresa Bernstein, Blanche Lazzell and Agnes Weinrich. Edith Branson received professional instruction from Kenneth Hayes Miller at the Art Students League and from Charles Martin at Columbia's Teachers College. Charles Martin was a protege of and a proponent of the teachings of Arthur Wesley Dow. In addition to Edith Branson, Martin's teachings had an effect on many artists including Georgia O'Keeffe who also attended his classes (1914-1915). Branson's early paintings were influenced by Cubism and Synchromism but expanded to include Surrealism in the 1930's. 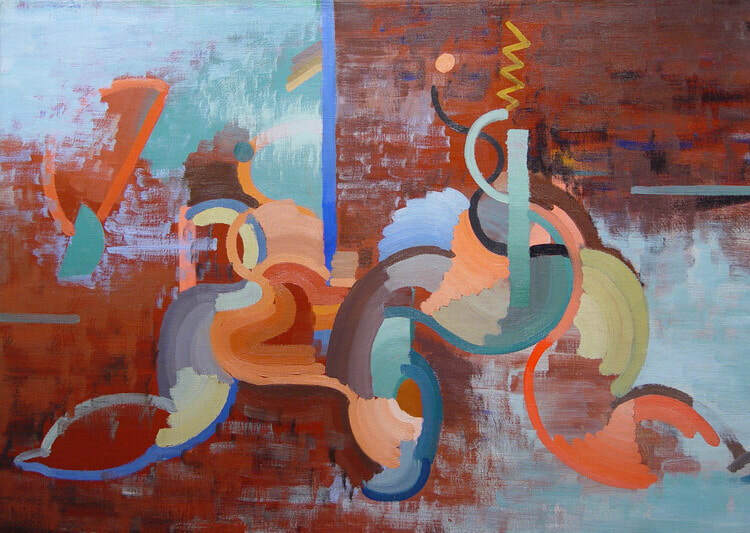 In the Foreword to Edith Branson's solo show catalogue, it was noted that she worked "in purely abstract forms in which she feels she can best convey her joy in color. She believes that all the depth of emotion that can be experienced through sound, can also be experienced through color." Most of Branson's work is reflective of her personal life as a young woman living in the 1920's and 1930's. Though not autobiographical, her surrealistic works introduce a woman's introspection into the many social changes of the day.